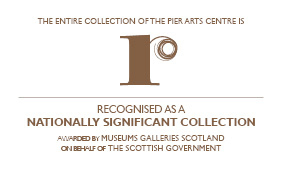 The Pier Arts Centre in Stromness, Orkney was established in 1979 to provide a home for an important collection of British fine art donated by the author, peace activist and philanthropist Margaret Gardiner (1904 – 2005). The permanent Collection includes works by major 20th Century artists Barbara Hepworth, Ben Nicholson and Alfred Wallis, amongst others, as well as contemporary art by Sean Scully, Eva Rothschild and Olafur Eliasson. The Collection also includes local artists including Sylvia Wishart and Stanley Cursiter. Although small, it is regarded as one of the finest collections of the period in the UK. A Recognised Collection of National Significance to Scotland, key works are regularly loaned to prominent exhibitions around the world. The Pier Arts Centre is also a partner of Tate, and exchanges programmes, ideas and skills with the Plus Tate network of visual arts organisations across the UK. The Centre also curates a year round programme of changing exhibitions and events for the education and enjoyment of the general public. Housed in a complex of buildings with a rich history, the Centre re-opened in July 2007 following a major redevelopment. This included creating a stunning award-winning new building on one of the piers which characterise the historic town of Stromness. The Pier Arts Centre acts as a focal point for the local artistic community. It has a valuable library and archive which is accessible to the public, and runs a programme of education and outreach activities for groups of all ages. Margaret Gardiner first visited Orkney in the 1950s and later converted the old quayside building to house her collection of modern paintings and sculpture. Born into a well-to-do family, Gardiner studied at Cambridge University before a brief spell as a teacher.